If you’re making a big bone-in ham for the holidays this year, don’t throw away the leftover ham bone once all the meat’s been cut off. It’s a key ingredient in this soup that adds instant flavor with minimal effort! Here I added some vegetables, potatoes and cabbage, there are no beans but you can add some if you wish. So delicious and easy to make! I made a slow cooker ham the other day and saved the bone just to make soup. Freeze the bone if you don’t plan on using it right away. You can make this on the stove in a big soup pot, Dutch oven or Instant Pot as I did here to save time. This would also be great in the slow cooker. I’ve made this soup a couple of times and it’s very good. The first time I used both the ham bone and the ham. The second time just the ham bone and I picked the ham off the bone. This recipe was amazing! It was the first time my kids both loved something I made for dinner equally. Changes:I made in the instant pot:saute onions and celery2 box containers of Trader Joes Free Range Chicken Broth (Not Low Sodium)add ingredientsmanual cook for 60 minutes – natural release, go to work.Later that day…remove bone and cut up ham to chunksadd the rest of the cabbagecook manual 20 minutes, natural release 15 minutes, quick release the restMy ham bone had lots of meat on it.I put half the cabbage in and added the other half 30 minutes before serving. I left the potato out. I cooked in the air fryer and added after the soup was in the bowl. Love love love this soup. Such a comfort food and such low points. And it freezes well. Will definitely make it again. I’m not sure what was missing when I made this soup but it seemed a little bland. I cooked the ham bone and broth the day before, refrigerated overnight and skimmed off the fat. I tasted the finished soup and added some thyme, parsley and black pepper. I will try adding some dill to see if that brightens it up some. It’s a great basic recipe that needs just a little help. I, too, was concerned with the lack of seasoning…. but ham has a lot of salt to begin with. I added a sprinkle of kosher salt & oregano, basil, parsley (unsalted Italian seasoning) to the onions, celery & garlic while they were sautéing. I cooked mine in the Instant Pot & omitted the potatoes during the first 20 minute cook time. Instead, I added finely chopped potatoes with the cabbage during the last 5 minutes. Yes, the carrots were cooked well… but the potatoes were perfectly done which was a nice balance. do u have use a ham bone? … i have a large piece of left over ham could u caught up that and use it soup? Geeze, so glad you had this on the meal plan!! I forgot about it–made it last year with the leftover ham, and it was DELISH!!! !Thank you for all you do, and HAPPY HOLIDAYS!!! Great soup. Even my picky eaters like it. This soup is delicious ! This is the second time I have made it, I didn’t have a ham bone in hand but I did have a game steak and I fried it in my Dutch oven so I could have all those beautiful brown bits on the bottom of the pot and it comes out great ! Thank you for this wonderful soup ! This was great! Wonderful flavour.I did find the veggies got a bit overcooked but that doesn’t bother me. Maybe next time I’ll cook it a little less. How long in a slow cooker?. Med or low heat? Ad cabbage anout an hr ir 2 vefire the end? 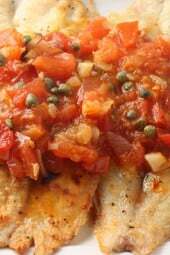 I am a new fan of this site and this recipe! 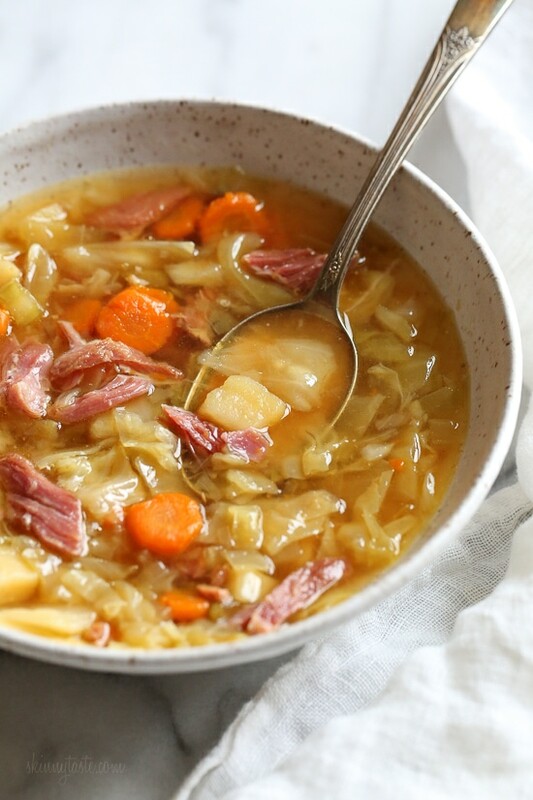 I have never had a ham and cabbage soup. It’s always split pea or a great northern bean soup recipe for that twice yearly ham bone. So after a garage refrigerator died and accidentally thawed my spare 0.77 cent per pound Easter ham, I went crazy with my instant pot. Because who wants to cook a ham for 3 hours in the oven in August? This recipe totally rescued me. I ended up pressure canning the soup so now I have 4 quarts of shelf-stable ham and cabbage soup!! Thank you so much for the idea/recipe/inspiration. At 15 grams of carbohydrates this could probably be considered low carb as well. Looks delicious! Hi Gina, I just used the calculator and added the nutritional information. When do you remove the ham bone? Before or after adding cabbage? Easy and tasty soup! Cooked in Dutch oven on stovetop. Didn’t have yukon gold potatoes, so used one cubed idaho potato and one carton of cannellini beans. 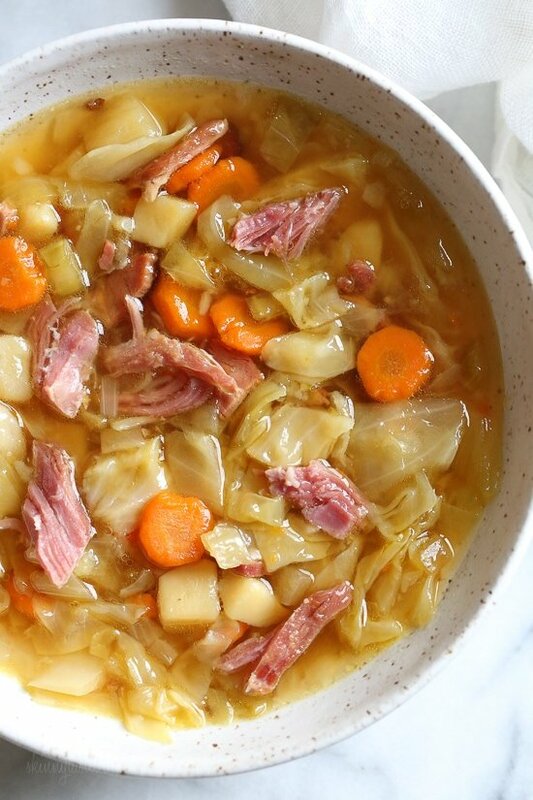 This will be a go-to soup for leftover holiday ham. Right after Easter, of course we had a ham bone and I thought I would surprise my wife and make something. Being in Iowa, it was too cold and snowy for golf. Your recipe for this soup caught my eye and I made a trip to the grocery store and got to work. To my surprise, my wife said it might be the best soup she ever had, I probably made a bit more work of it than needed but it was fun and very rewarding. I will look for more ideas from your recipes. This was amazingly really good. The only change I made was to double the broth, more water, added garlic powder, and Mrs dash table blend. WOW! SO GOOD! Really delicious! I used water instead of chicken broth and it was plenty flavorful with just the ham bone. I had a 21 pound smoked turkey and used this recipe . Was a great soup helped me to use of all the drippings. plus my gravy. Loved this soup. Excellent flavor and texture. My family loved it too. I am having some leftover for my lunch today. My son-in-law asked for some for his lunch too! Even my 5 year old granddaughter commennted on how good it smelled when she walked in the door. I will definitely make this again. So amazing! I crave this soup! My daughter who is somewhat picky loves it! I made a broth from my meaty hambone before I started and then made the soup on the stove top. That way, the veggies didn’t get too over cooked. I I stripped the meat off the bone and added it to the soup once the veggies were cooked. I also added fresh dill to the soup. Omg. So good! I love SkinnyTaste! This soup is awesome. I’ve made it twice. When I calculate the points though it came out 4 not two? Any ideas? I made that tonight and it was tasty but the potatoes totally disintegrated when cut into small pieces. ALso, where are the seasonings?! Just becase its healthy doesnt mean it has to be bland Not even salt or pepper! I added basil, oregano, a bay leaf and salt and pepper. Much improved favor anf could have used something more. How does the potatoes freeze ? Won’t they be mushy when ready to eat? Hi, I’m trying this recipe and added diced chicken breast because we didn’t have a great deal of the ham left. Everything else was conveniently available in the kitchen. The instructions were super easy to follow. My sweetheart and I worked alongside each other to make this happen. I hope it turns out alright…. Crossing my fingers! Hi! I don’t eat pork. What would be a good meat replacement? Thanks! I don’t have a ham bone and I don’t live near a Honey Baked Ham store. What can I use in it’s place? I’ve tried ham hocks before but they are full of fat and it seems like the fat just melts into the soup. I was hoping it would congeal on top and I could scrape it off, but it didn’t. Any suggestions are welcome. 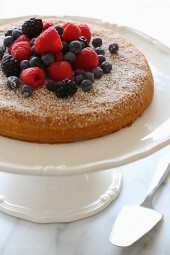 I’d love to make this soon. Thank you so much. This was terrific! Never made ham bone soup before—it was super surprisingly easy and had great flavor. Until recently, cabbage wasn’t something I enjoyed. (I think the smell and the slimy texture when over cooked turned me off). 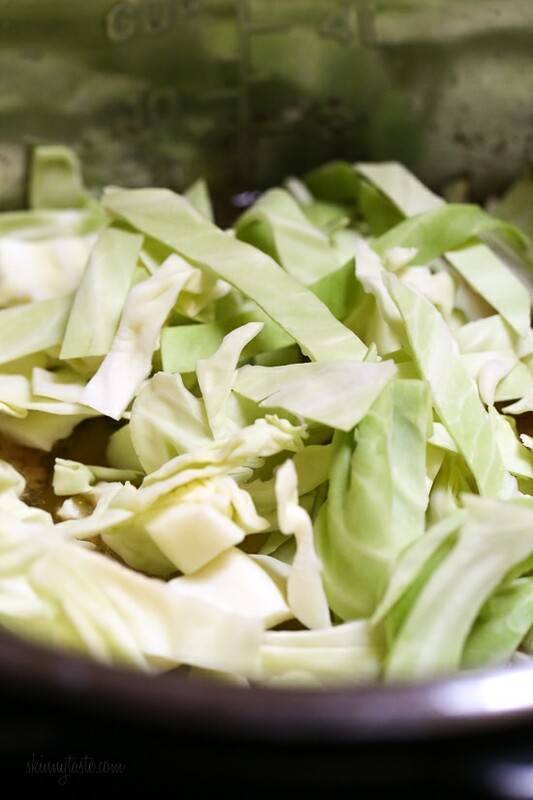 I am glad that I’ve started finding yummy recipes that include cabbage —it’s definitely grown on me. I notice that this recipe isn’t labelled as ‘freezer friendly’ but thinking that’ll probably would freeze ok, maybe the potatoes might go a bit mushy. Has anyone frozen it? Yes, this can be frozen. Delicious, crazy depth of flavor and so point friendly! Worth making a ham”just because” in order to make the soup! I just made this last night, and I cannot believe how tasty this is! WOW!!! Your recipes really are making it easy for me to give up on my unhealthy cooking habits:) Thank you! This soup was delicious Will definitely make it again. I am new to having an instant pot and am trying to make this soup today as it looks so good! I sauteed everything added the ingredients and then started the pressure cook. It never did come to pressure cook but rather displayed “burn” on the read out. I am so disappointed and am not sure what I did wrong. I had made ham broth from the bone in crockpot for about 16 hours and then froze. Wasn’t sure what I was doing with it until I saw this recipe so I used instead of water and bouillon. Added an extra carrot just so it wouldn’t be left all alone in the crisper. It was delicious! Husband says it is one of the best soups he has ever had! Delicious! My husband and I loved it! It tastes just like my Mom’s, and that’s saying something. It’s definitely a “make again” recipe for me! Thank you, Gina. This was great! My husband dislikes beans, so I tried this instead of bean soup. I used some smoked turkey bones I had frozen from Thanksgiving – Winner, Winner!!! I did add some extra carrots and I cheated and used pre-shredded cole slaw mix. I also made it in the crockpot; browned the veggies first, then cooked it on high for 4 hours, adding the cabbage in the last 1/2 hour. Made this after the holiday and it was fantastic! 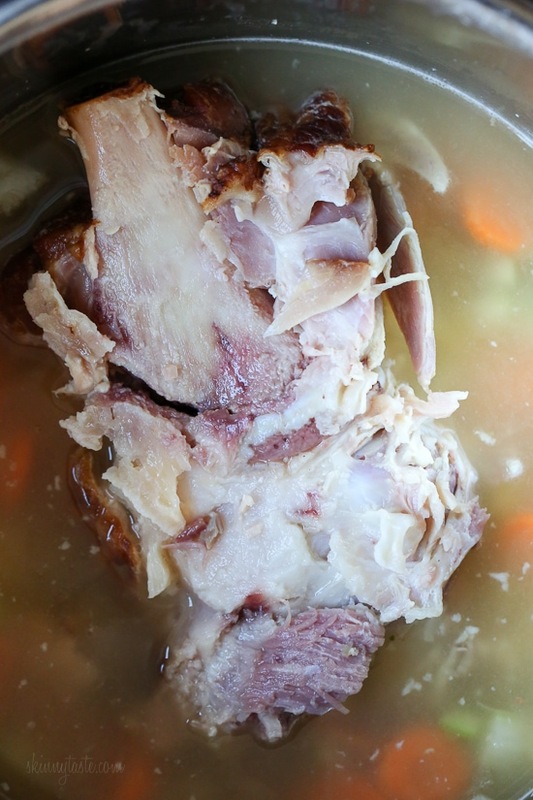 Very easy recipe and will be my go to for leftover ham bones! Doubled the recipe (except for the cabbage) for leftovers. I was looking for something different and good and this was great and easy! Can this be made with other types of ham? Sure you can use ham steaks and chop them up. Thanks Gina! Going to try this on cold and snowy weekend! I have a couple of russet potatoes to use, would they work in place of the yukons? I made this yesterday and as I suspected, it was absolutely delicious!! I wanted to use the ham bone for a soup but not a bean soup. This was just perfect for a change up. You are still at 100% for me on every recipe I have tried of yours Gina!! Thanks once again. PS: I always spread the word too, at least 3 people this week. What spices would be good to add to this?? I agree! Seems like there should be something. I’m thinking kosher salt, celery salt, and a bit of dill. Will add shortly. This soup is so delicious and especially warming on a winter day! I made a “ham broth” earlier in the week with the bone, onions, celery and carrots – and pitched it all except the broth. When it was time to make the soup, it came together quickly and easily, and put in chopped slices of ham. I also made it low carb by not using potatoes. DELISH! Nice to have an alternative soup with ham other than split pea or bean! I have a ham bone and plenty of juice from it. Can I use the ham juice instead of chicken broth or will that be too much ham flavor? Made this today! I was able to double the recipe because my dad left a lot of ham on the bone he gave me. It tastes awesome and so good on this frigid cold day! Yum! I am a new instant pot owner and I want to try this recipe since I had a bone-in ham for Christmas. If I want to make a double recipe, can I double the liquid? What’s could I substitute for ham.? I only eat poultry…. We freeze the carcass from the turkey at Thanksgiving and use it as a base for a pot of soup. If it’s a large turkey we divide the bones in half. You can also use chicken bones. It’ll taste different than the ham soup but should still be good. This looks delish! How would you replace the ham with chicken if you don’t eat pork? I’ve used 1/2 to 1 tsp smoked paprika as a substitute for ham in other recipes and it gives that great smoky depth. Used it in Gina’s Ham Bean Kale soup and it works great! My mom and grandma made this all the time with the ham bone. We called it ham & cabbage. I just boil the ham bone, no broth needed. If stock seems really rich, I reduce and freeze half of it for split pea soup. They do sell ham base but it is high in sodium. Many times I boil the half ham about 15 min before baking and that stock can be used for soup later. I love soup and this looks like a fantastic recipe. Thanks. Looking forward to making this recipe. Thank you. We enjoy all of your recipes. I am giving your cookbook for my Rob Your Neighbor give on Christmas Eve. I have marked all of our favorites. While looking through the book, I found more recipes I want to try. Thank you again. Since I only get one ham bone a year–live alone and buy ham for a luncheon each December–and I couldn’t bear to give up pea soup, is there any way that I can replace the ham bone in either the pea soup or this recipe? There is a Hone Baked Ham store neaby! Thanks,for the suggestion, I will do that. I use my ham bone to make ham bone broth, and it makes enough for both pea soup and this recipe. I leave some meat on it and pressure cook it for two hours to concentrate it, then put it in the refrigerator so I can defat it. So take four cups of that to substitute for the chicken broth in this recipe. Ham broth is also fantastic for cooking black beans or potatoes! You read my mind! Can’t wait to try. Love all your recipes and thorough instructions! I have been making a very similar recipe for years. 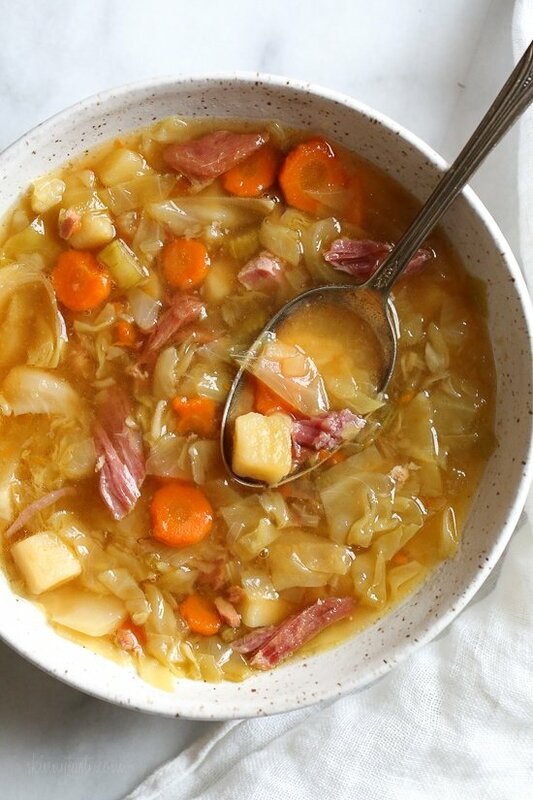 I tried using ham hocks one year as I had no ham bone and wanted this soup, ham bone makes a better soup. I will also make a rye bread crouton top with swiss cheese for a richer soup. Love the flavor of this soup!!!!! This looks yummy…and a great way to use the ham bone from our Christmas ham! Can it be made in the IP Duo Mini? Thanks! The potatoes are going to disintegrate if diced small and then cooked for 20 minutes on pressure. I thought the same thing. When I make potato salad, I use cubed potatoes and they only take 4 minutes HP. I found this soup to be tasty but very soft for my personal preference. I like to have crunch to my veggies and this is too mushy. Next time I’ll do it on the stove top. I also think its lacking seasonings. Now I know for next time. Hi!!! I make your recipes all the time!! What about if I want to make this in my slow cooker? How long would I cook it for on low? 8 hours? Thank you so much!!! Huge huge fan! Put in cabbage 2–3 hrs. before completion to avoid getting overcooked and mushy. Could this be made in a slow cooker or oven as well and if so how long would you recommend? I would put the cabbage in 2–3 hrs. before completion. Ours got a little mushy. I LOVE this dish at St. Patrick’s day and never thought about making it into a soup. Can’t wait to try! Question about timing in the IP: sautée initial ingredients for 5 mins, then it takes about 15 mins to get to pressure, then you cook on high pressure for 20 mins, then natural release which takes about 15 mins, then add the cabbage—here’s the question—does it take another 15 mins to come up to pressure again? If so, you cook it with cabbage on high pressure an additional 5 mins, and then quick release which is another 5 mins. So a total of an hour and 20 minutes in the IP? Does it save time then to do it in the IP? Once its boiling it doesn’t take too much time to come up to pressure, you can add it in the beginning but it will be really soft. You can also do a quick release instead. Lastly, sure you can make it on the stove.